May 30, 2015 will be the fortieth anniversary of Pre's passing. This piece was written and sent to us by Paul O'Shea and has appeared in Cross Country Journal. Many thanks for allowing us to use it, Paul. 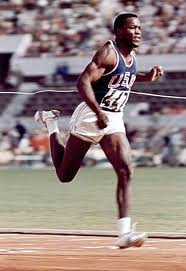 I saw him run once in person, at the USA vs. Pan-Africa meet in Durham, NC in the 1970s. He ran a 5K against Mirus Yifter among others. With 2 laps to go Yifter took off in a full sprint so Pre went with him. After 300 meters of that and 500 meters yet to go, Pre broke and surrendered to Yifter, unable to sustain that pace. 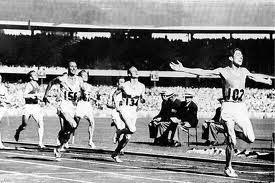 As he crossed the finish line with one lap to go Yifter left the track, thinking the race was over, having miscounted his laps. Pre revved it up again, winning the race with Yifter unable to continue. What was amazing to me was that someone actually broke Pre, but it was only because of a miscounted laps problem. 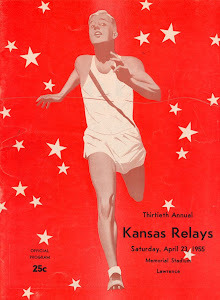 the experience of a quarter miler, half miler under his belt. 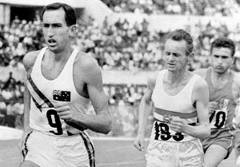 See this website for info but also a well documented history of the race. I have attached the website for this race as it could be of interest to some ultra marathon nuts. Also in the web site is the history of the first race. 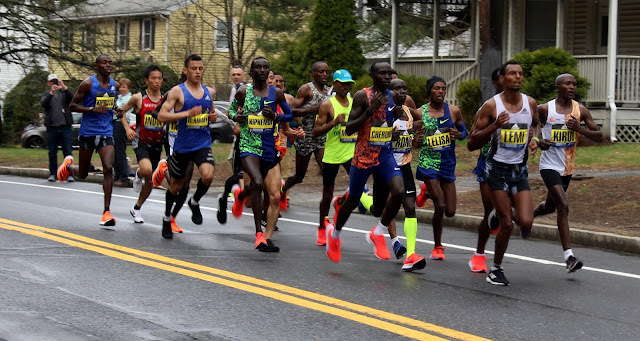 It is a great sporting event and the full race from start to finish is broadcast with most of the country tuning in to watch. 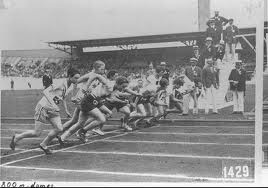 The winner will complete the race in about hours 30 minutes. The cut off time is 12 hours. The bulk of the field finishes in 11 to 12 hours. 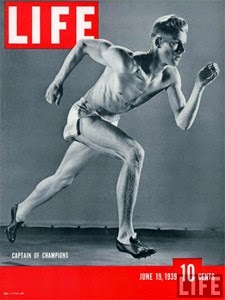 Yesterday we posted a list of men and women athletes who perished during wartime. Some were in the service of their respective countries, some were innocent civilians, some were victims of ethnic cleansing. 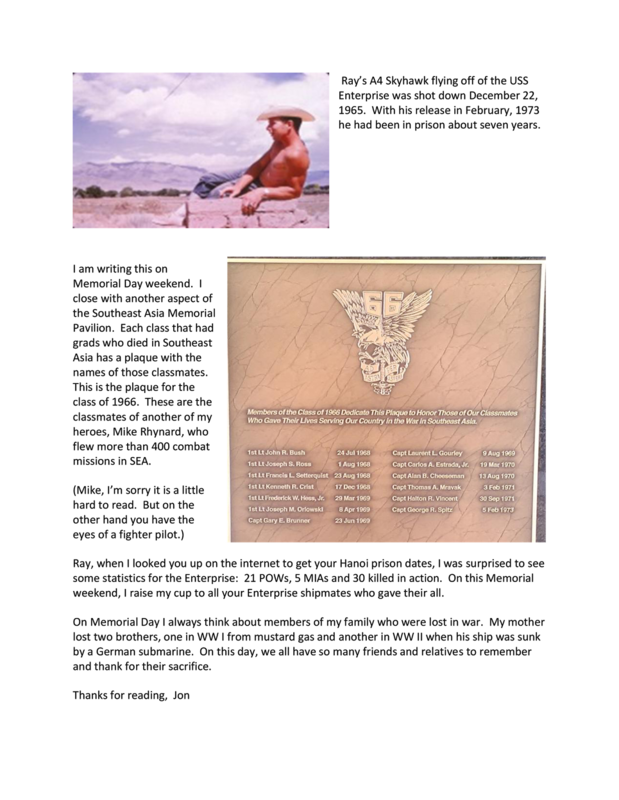 This morning I received this piece by Jon Epperson, one of our regular readers commemorating men from the US Air Force Academy who were interned in North Viet Nam during our long conflict with that Southeast Asian nation. Jon reminds us of the things that happen when people are imprisoned by their enemies. Rarely do good things happen once a person becomes a prisoner of war. The eye for an eye mentality of the human condition takes over, and the one who may have inflicted the suffering now becomes the victim. It's something the powers that be forget to remind us of when they ask their citizens to go somewhere to fight for what is deemed right. 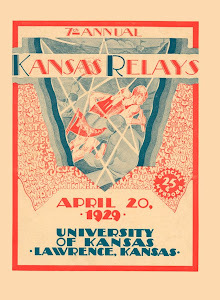 As you read through the article, you will see the track and field connection. 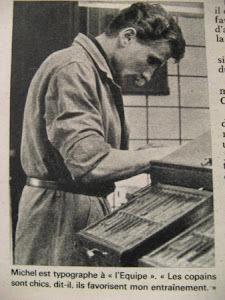 Today I also remember a friend, Dr. Giovanni Balletto, who was interned as a civilian for 6 years by the British in WWII in Kenya. He was a skilled mountain climber, and while in prison at the base of Mt. 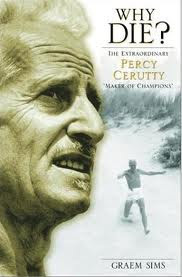 Kenya, he and two other alpinists scrounged food and made climbing gear, broke out of the prison and climbed Mt. Kenya and raised an Italian flag on one of its peaks. Then having nowhere to go from there they broke back into their camp and turned themselves in. It made one of their six years more memorable than the others, I'm sure. That story can be read in the book No Picnic on Mt. 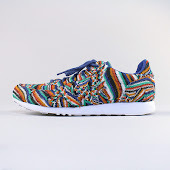 Kenya by Benuzzi. 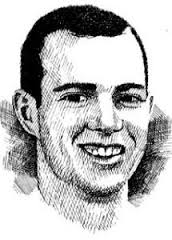 Jon's piece also reminds me of one of my teammates at the U. of Oklahoma, David Phillip Neisler, from Ft. Smith, Arkansas who died on his first SE Asia mission with the Navy as an aircraft carrier pilot. According to records, the catapault bridle on his plane separated prematurely as he was taking off and the Phantom F4D went into the ocean off Viet Nam. Phil was trapped in the cockpit. The other crew member managed to eject and was rescued. I remember seeing Phil on ROTC Tuesdays wearing his class A's on his way to drill. A really handsome guy, and in my 20 years old naivete not realizing that uniform had already sealed his fate. So here is Jon Epperson's salute to those men who served, survived, and to those who died. Richard Mach (Western Michigan University ) sent this in after reading the above postings. Wrote this tiny piece for the celebration a year ago last October around the 50th anniversary of the back to back Div I team championships Western won in cross country. The center piece is John Fer. May have sent this to you earlier, but don't believe so. He transferred from USC after at least 2 years there I recall and started all over again in the rigorous program @ the Academy so this guy was, like the Aussies often were who were coming over to compete in our nation's colleges, a few years older which did give them -- and him -- some advantage. After the fall races, John won the NCAA 10,000 m race outright the following spring. During this period in American history, we, as a country, were enmeshed in a far off war that soon enough invaded our living rooms every night on the news. 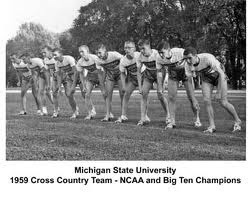 As athletes who competed against the service academies — all three - but especially the AFA, with which we traded venues each year in cross country and they were invited to the WMU indoor Relays in late winter, our trajectories intersected those of athletes who were going to go on to war after graduation. One story especially is telling about the times then. In 1962, Reid, Hancock, Bashaw, Green, Tom Martin myself and another flew into Denver the night before and spent a restless night at 6900 ft elevation @ the academy — our bone marrow trying desperately, on very short notice, to make much more hemoglobin. The next morning coach warned us about the plebes, who were clustered at the start/finish line found @ midst of what proved to be a most daunting figure 8 four mile course, as to their not so polite inquires if we’d like an oxygen tank. 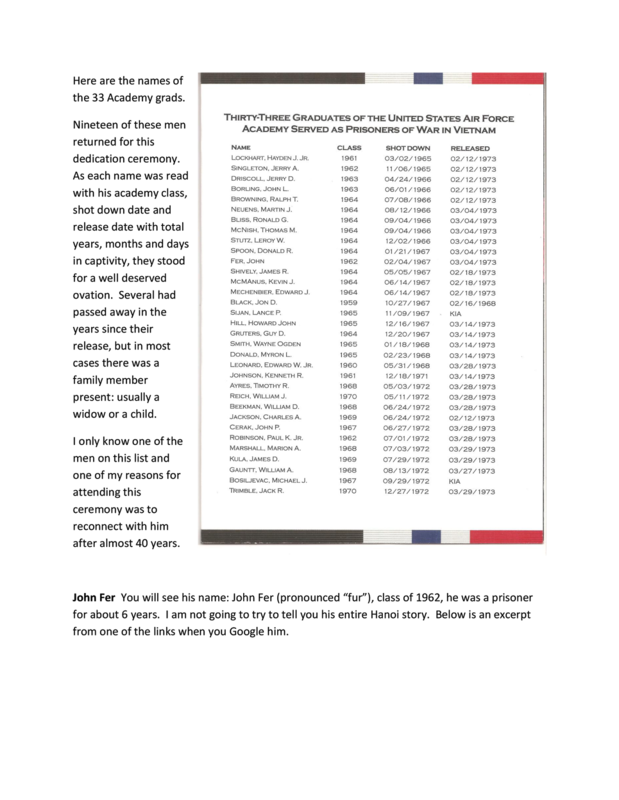 Every Memorial Day we publish this list to honor those who fell in war and who were also Olympians. 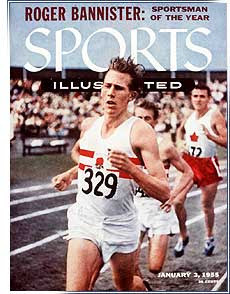 A complete list of all Olympic sports, not just track and field, is shown here. This list is from the website Sports-Reference. I once found another site that referred to 4 or 5 previous winners of the Tour de France who died in WWI. We all know that a foundation in sport and experience in high levels of competition is no guarantee to a long, happy life. Previous wars involved more people from all walks of society. Now our government has found a way with the all volunteer army, to promote military adventures without calling on the whole of our young population to be sucked into the program. So far fewer contemporary athletes making great salaries are tempted to be on the front lines. A few exceptions, like Pat Tillman have turned their backs on the big bucks and served their country. Many could probably not find Afghanistan or Iraq on a map. 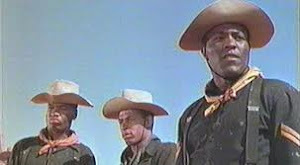 So thanks to those young guys of the past who stepped up to the plate when their country called, some but not all of those being Cliff Cushman, Foy Draper, Charley Paddock who didn't make it back and those like Mel Pender, Louis Zamperini, and Ted Williams who did come back. I've looked for some other articles of a similar nature. This one appears today in The Independent on British footballers and cricketers who perished in WWI. It is an amazingly high percentage of international level sportsmen. Our blog has on occasion brought people together over the years. Some were former teammates who had lost touch, some gatherings were with people who had never met. The case in point is an example of the latter. 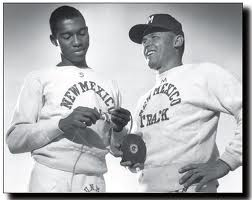 Earl Young (Abiliene Christian University) and Pete Brown (University of New Mexico) had competed on the same fields of honor back in the early 1960s, but never against each other in the same event. However through a number of circumstances they were able to get together for lunch the other day. 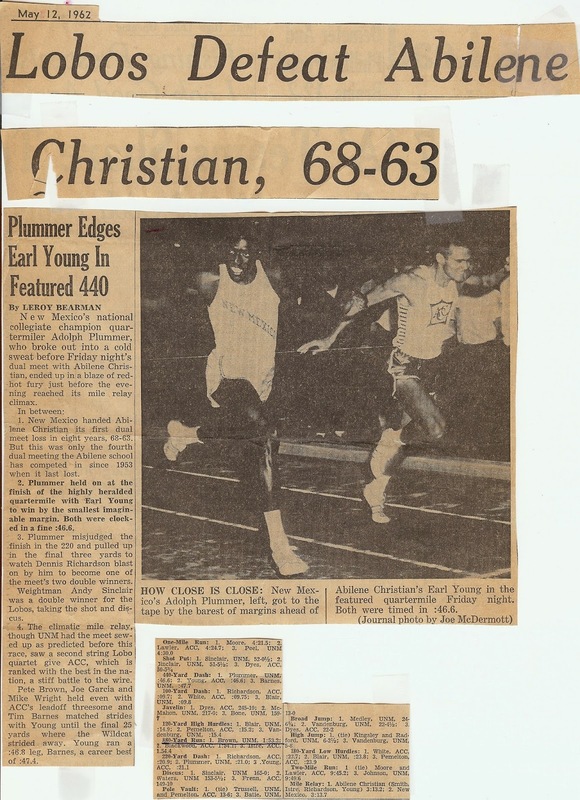 Many of you probably remember Earl from his winning a gold medal on the 4x400 at the Rome Olympics in 1960 as well as his many great 440 races for Abiliene Christian College (now University). 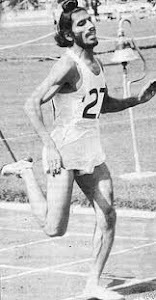 Few of you would remember Pete who was a better than journeyman half miler (1:52) for the Lobos. 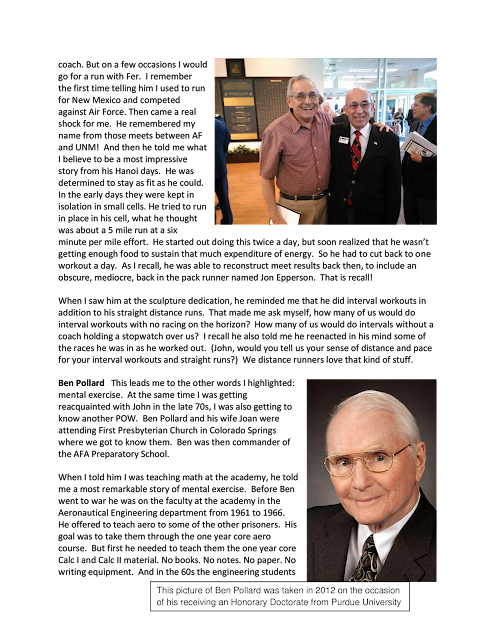 Both men have provided photos and stories for this blog over the years. 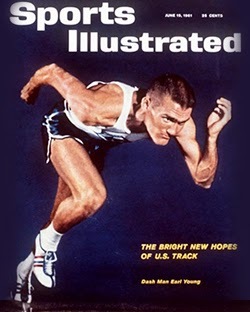 Pete even sent us the whole set of 1963 Track and Field News journals to use when working on that year. Here are Pete and Earl's description of that meeting and a few more photos. 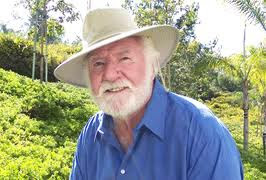 For years Pete ran a very successful historical tours business focusing mainly on US battlefields all over the world. A few years ago Earl was the recipient of a bone marrow transplant, and thanks to that donation he is still around to tell his story. You can read more about how he is working to help others in the same predicament. Earl Young Website Perhaps amongst the several hundred people who will read this story all over the world, someone will take the opportunity to become a donor. 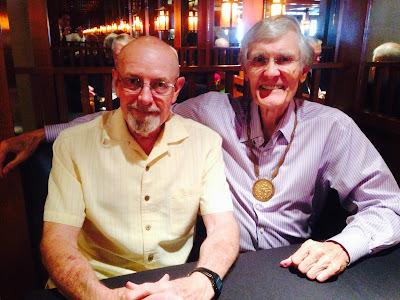 Here I am at lunch today with Earl Young. 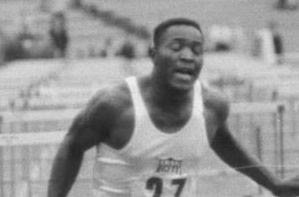 He competed for Abilene Christian out of San Fernando HS. 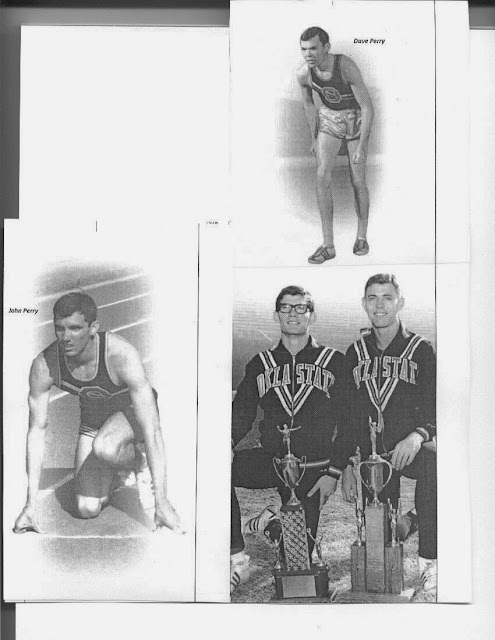 A member of the class of 1958, he ran the 440 PR of 49.6 at age 17 that year. 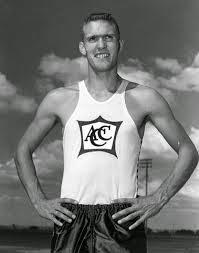 One year later in Abilene he moved it down 3 full seconds to 46.6 and the next year won gold in Rome in the 4x400 relay (with Glenn Davis, Otis Davis, and Jack Yerman). 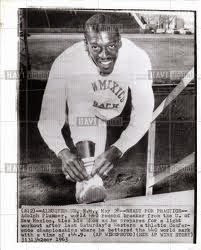 We both agreed that had Adolph Plummer submitted himself to rigorous training and with today’s facilities he would be the greatest who ever ran the event and own the world record. We’ve never seen anybody better than Plummer; Earl buys in 100%. 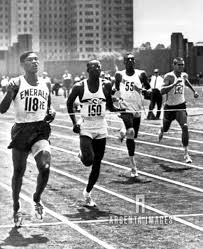 Plummer beat Earl a couple of times in college in some big races. 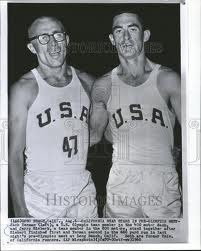 Earl won his share against Adolph and it was a memorable rivalry in the early 1960’s. Bobby Joe Morrow (3xOlympic Gold medals in 1956) came out to San Fernando with Coach Oliver Jackson and recruited Earl Young. His HS time was pedestrian, but Jackson saw something he liked in a photo of Earl and went after him; a good move. Local colleges turned up their noses at him. At 6’4” and 170lbs, Earl still has the same measurements he had in college. 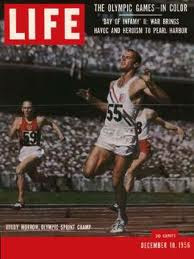 His relay split in Rome on a dirt track was 45.9. 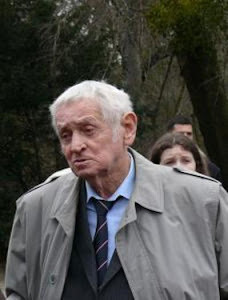 He’s a wonderful man; a Christian gentleman who will have a glass of wine now and then. He raises awareness of blood cancer (which he survived thanks to a bone marrow transplant in 2011) in his retirement and lives in a high rise just north of downtown Dallas. You don’t make the cover of Sports Illy for nothing. He was damn good and I think Adolph will agree. Earl’s website is well worth watching, especially his video: www.EarlYoungsTeam.com A bone marrow donor saved Earl’s life 4 years ago and he’s giving back many times over. Anyone who can spread the word on Earl Young’s Team should consider doing so. I ran the 880 in a number of meets when Earl was running the 440 and 220, but never met him until today. 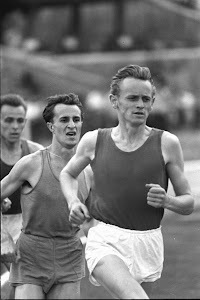 Editor's note: Pete won the 880 that night in 1:53.2. 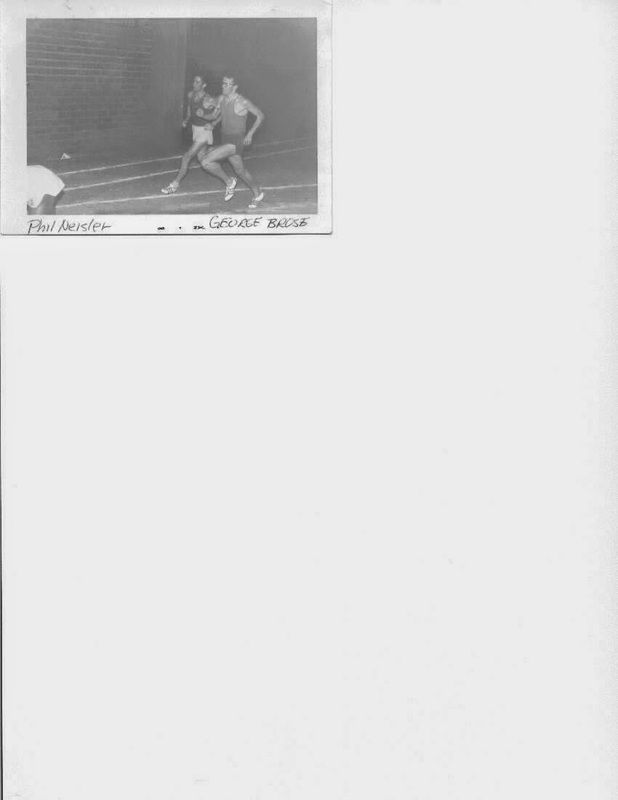 Hi Pete ... Found the article on the ACC-UNM Dual Meet... What an eye opener this track meet was for a skinny little Sophmore 2:02 880 runner .. Had no idea humans could run so fast.. had no idea track teams could be so strong.. had no idea anyone could run a 1:53 880 ..
On May 8 four world records are set, one a near certainty, two are pleasant surprises and the fourth a total shock. Before we get to that day we need to update the world record in the shot put. Our last report had Randy Matson breaking Dallas Long's WR by an inch and a quarter at 67-11¼. Surely he would cross the 68' barrier soon. Well, yes and no. 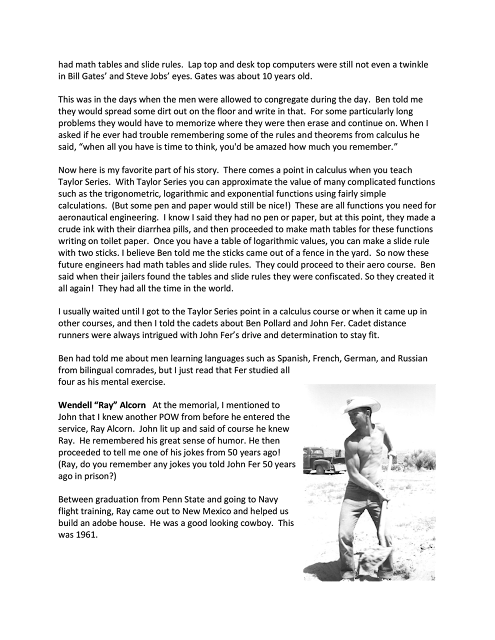 As far as the record books are concerned, he skips 68 feet entirely, for on April 30 in a triangular meet in Austin, Texas, he throws 69-0¾, increasing his record by an incredible 13 inches. 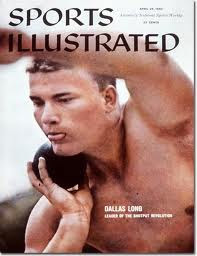 He also throws the discus 195-10½, breaking Bill Neville's college record. Wait a minute, didn't we just report that he had thrown 201-5? Yes, we did and yes, he did. However it seems that an awkwardly worded rule has erased that record. Matson's 201-5 throw indeed went that far, so what's the problem? Well, it seems that the discus landed at a spot four feet higher than the ring from which it was thrown. Even those of us who sat in the back of the room in hopes we wouldn't be called upon can figure out that if, indeed, the discus landed higher than the spot from which it was thrown, the distance would be shortened and no advantage gained. One would think so, but the rule reads that a throw can not be submitted for a record if the incline is more than 1/1000 (think one inch in a thousand inches). The wording doesn't differentiate between an upward incline and a downward incline. An incline is an incline and if it is more than 1/1000, the mark can't be submitted. This was the rule in 1965. We aren't capable of making stuff like this up. Sorry, Randy. That fully discussed, let's jump a week ahead to the matter at hand. 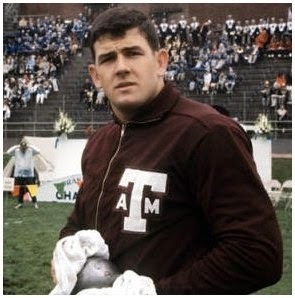 The scene is the Southwest Conference Championships at College Station, Texas. 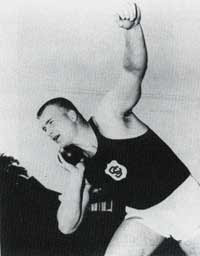 Randy Matson, the world record holder in the shot put at 69-0¾, steps into the ring. When he exits, he has increased his record a jaw dropping foot and a half to 70-7. That this is the greatest record in the history of the sport is not up for discussion. In a month he has raised the world record 2' 9” or 4.06%. He is currently 6'7 ¼” better than the next best shot putter in the world. He credits his improvement to weight lifting that has enabled him to gain 50 pounds since high school. 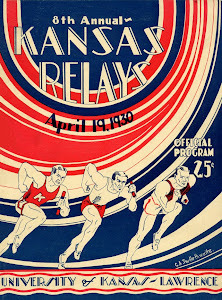 On this same day, 1660 miles to the west, the West Coast Relays are being held in Fresno. The gun is up for the 440 relay in which the world record of 39.9 is held by the Australian national team. The crowd is anticipating a tight race among New Mexico (40.3), Cal (40.3) and San Jose State (40,4). This is what they get and then some. Wayne Herman puts San Jose State in the lead at the first pass, but because Stanford makes a great pass from Eric Fische to Dale Rubin, the Indians have the advantage down the straight. 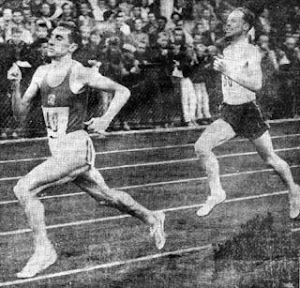 Rubin makes an efficient pass to long jumper Bob McIntyre who holds a slight lead at the final exchange to Stanford's only national class sprinter, Larry Questad. Once again the Indians execute a perfect pass and Questad can't be caught. Stanford's best time this season is 40.8. 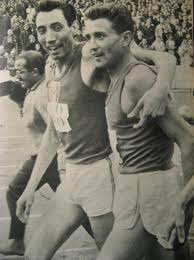 They were given no chance to win but that is less a surprise than the time, 39.7, a new world record. Questad wins the 100 later in the evening in 9.3, but Frische is a 9.5 guy, Rubin a 9.6 and the best McIntyre has run is 9.8. Individually they don't stack up with the competition, yet with perfect passing, the job gets done. San Jose State and New Mexico take second and third, both in 40.1, with Cal fourth in 40.4. A 440 relay record is nothing new for coach Payton Jordan. 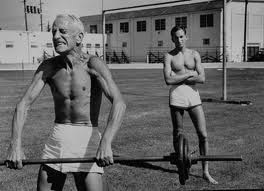 In 1938 he ran on the USC team which lowered the WR to 40.5. Western powers Oregon State, Brigham Young, UCLA and San Jose State are taking each other on in the distance medley. Mike Gibeau of San Jose gives the Spartans the lead at the end of the 880 leg with a 1:49,5 split, but UCLA's Dennis Breckow is just inches back in the same time. Bob Frey gives the Bruins the lead with his 47.8 leg, but loses ground to BYU as Bob Tobler brings the Cougars to within three yards with his 45.7. UCLA's German import, Arnd Kruger, runs his 1320 in 2:58.3 to lead BYU's Bob Richards by six yards at the final pass, but Pete Mewett's 2:56.9 is the fastest split and brings his Beavers into contention. 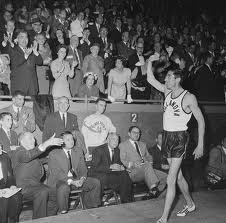 Although BYU's Bob Delany surprises with a 4:00.1, UCLA's victory is not in doubt. 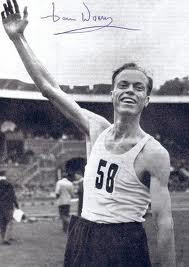 Bob Day runs an easy looking 3:58.4 to salt away the victory with a world best 9:34.0. BYU is second in 9:36.2. Oregon State, with Morgan Groth running a disappointing 4:07.8, falls back to third at 9:44.6, barely holding off Stanford's Paul Schlicke who runs 4:06.0 to finish in the same time. These are the top four times in the country this year. 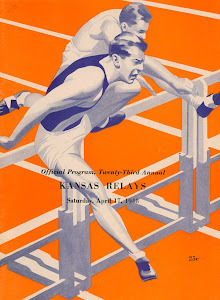 The Bruins were set to take on Oklahoma State in the two mile relay, but Bob Day suffers a cramp and they scratch, leaving the Cowboys without significant opposition. Surprising LA State has the lead at the first exchange, but then OSU's John Perry breaks the race open with his 1:47.5 and now it is the Cowboys against the clock. Tom Von Ruden does his job with a 1:49.3 and even though Dave Perry, recovering from strep throat, can do no better than 1:51.0, they break Villanova's record by six tenths in 7:18.4. 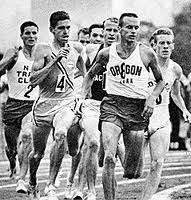 This is how Jim Metcalf who ran first leg of that race for OSU remembers the events. "The reason LA State, I thought is was San Diego State; anyway, the reason they had the lead was that I had trouble runinng fast times solo as a soph. 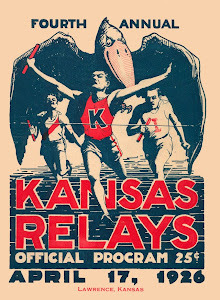 I had run 1:52+ lead off at Kansas or we would have broken the record. 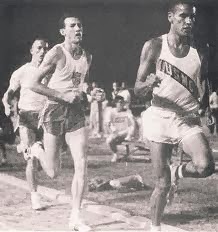 at Drake, I ran 1:50 and change because Ohio University ran their third best guy, a 1:49 man, first ,in hopes of getting a lead, then their second guy who was slow could finish even with John and then they had Barry Sugden and Darnell Mitchell who had been on the US national team. 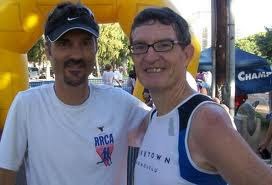 I beat their guy about 5 yards and and by the time John got thru with their second guy the race was over.... and we held them off with Dave being ill.
At Fresno, Hig convinced a buddy of his who was coach at LA State to run his anchor man lead off so I would have someone to run off of. He ran1:49 and I ran 1:50.7...their other three guys were just average. that is why they had the lead after the first leg." They weekend of the big relay meets, Penn, Drake and Mt. SAC disappoints in comparison. 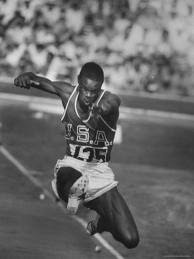 At Penn the biggest news is the high school triple jump record of 49-5 by Bob Beamon of Jamaica High. 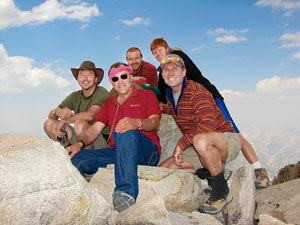 Smog and 90 degree heat are negative factors at Mt. SAC, but Ed Burke supplies the highlight by beating world record holder Hal Connolly by four inches in the hammer throw with a personal best of 221-2. Cold weather and a damp track are obstacles at Drake, yet Baylor and Southern put up marks that defy the conditions. After Ohio University takes the first section of the sprint medley in 3:17.7, just two tenths off Oregon State's collegiate record, Baylor erases the Beavers from the record board in the second section, running 3:17.0 on the strength of Rex Garvin's 1:47.7 anchor. The Jaguars of Southern dominate the sprint relays, winning in 40.5, 1:23.2 and 3:06.5 with the latter being the fastest mile relay in the world this year. Two weeks later they lower that mark to 3:05.7. The best mark of the big relay meet weekend belongs to New Mexico's Clarence Robinson who used the Drake long jump runway to record a leap of 26-9¾, equal to third on the all time list. 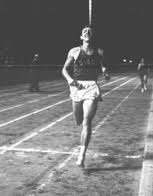 Remember last month's report of Jim Ryun claiming the high school mile record at 4:04.8, a mark inferior to his 3:59.0 of last year which didn't count because it was achieved in open competition? No need to fret further about this injustice. In the Kansas state meet he passes the 1320 in 3:02.0 then turns on the afterburners for a 56.3 final lap and a high school record of 3:58.3, also the fastest time in the world this year. One wonders what he can do with competition. 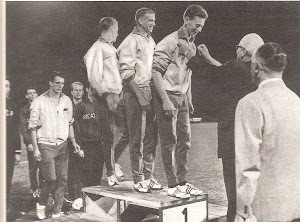 Speaking of national high school records, there is a new one in the long jump where Johnny Johnson of tiny Pacific Grove HS in California jumped 25-4¾ to better the mark of Oscar Bean by ¼ of an inch. Oh, remember that Beamon kid who set the TJ record? He's second at 25-2. There are intriguing circumstances in the game of musical coaching positions that seems to be going on. 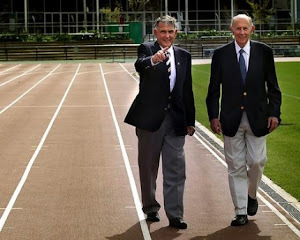 In an earlier report we told you that Kansas assistant, Bob Timmons, Jim Ryun's former high school coach, was going to Oregon State as an assistant and would replace Sam Bell who would become the new coach at Cal at the end of the season and that Ryun would be joining Timmons in Corvallis. Now we read that San Mateo College coach Berny Wagner will be the new Oregon State coach and that Bill Easton, the respected long time coach at Kansas, is being fired. Could this all be related somehow? More news as it becomes available. 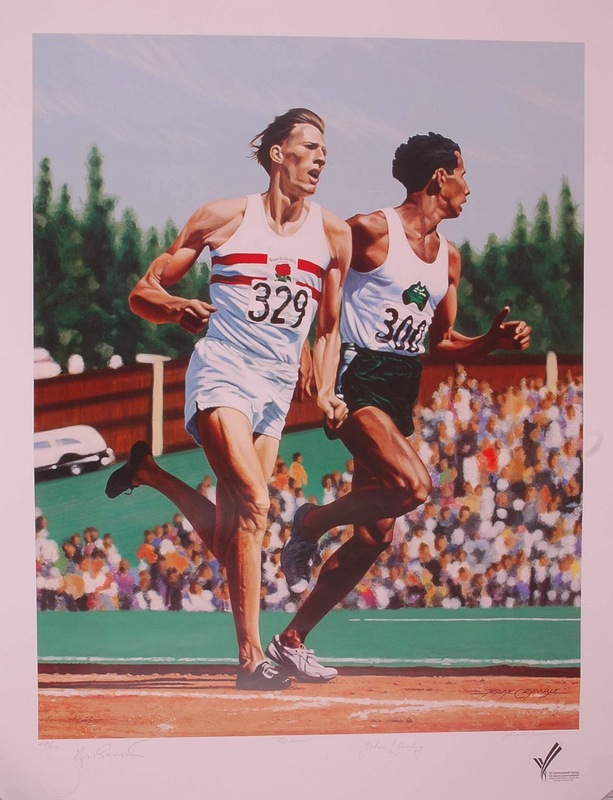 Few need be reminded of today's anniversary of the first sub four minute mile. This brief (5 min.) documentary might clear the cobwebs. 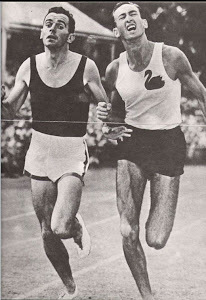 Also an interesting comment from Phil Knight how the Empire Games mile between Bannister and Landy later that year changed his life. Thanks to Tom Ratcliffe for sending this our way. Here is a question for our readers of a certain age, say born before 1950. 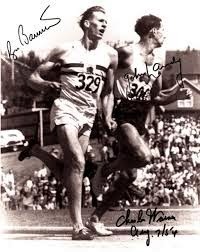 What Olympic Champion may have influenced your childhood before you even knew about track and field? Does the name Alfred Carlton Gilbert ring a bell? How about A.C. Gilbert? 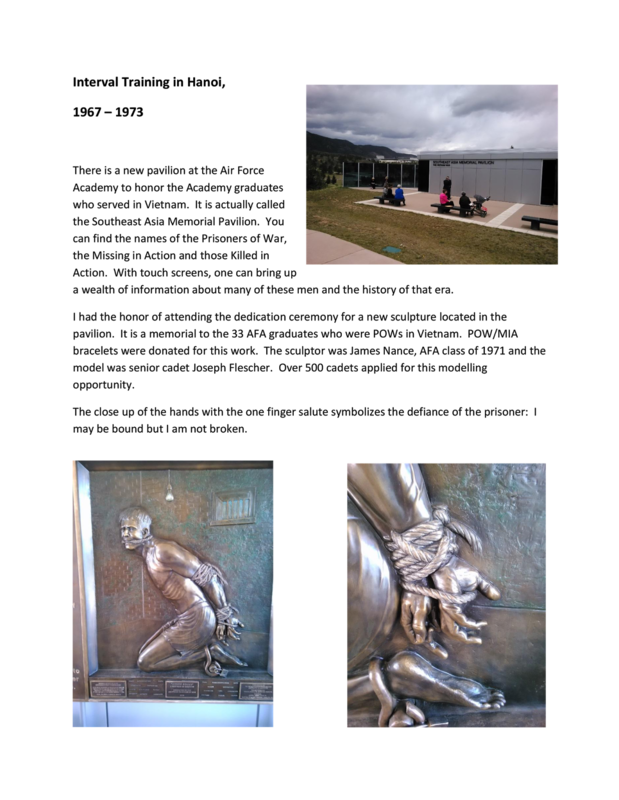 How about the pictures below? 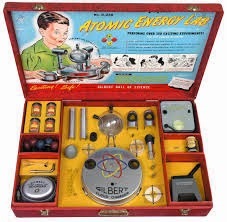 "For a brief period in 1951 and 1952 , an educational kit called the Gilbert Atomic Energy Lab, was for sale in the US even though i came with testable sample of four types of uranium ore and three different radiation sources (alpha, beta, gamma) . A surviving copy of the kit has been on display recently at the Ulster Museum in Belfast , Northern Ireland, but the radioactive materials had to be removed before the kit cold be shipped to Belfast. (The kit had failed to sell well; kids apparently prefered the company's erector set). So , Roy, your kindness was repaid in spades with this new posting. Further below is an article I found in the Old Yale website talking about Gilbert's storied past. I think the only thing we made with the chemistry set were stink bombs and maybe a little gunpowder. Saw a few titrations go from blue to red or visa versa. 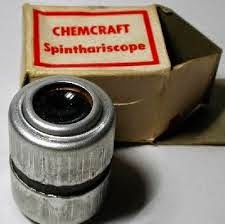 I do remember peering into the spinthariscope in the atomic energy lab and seeing flashes of radiation as I lay in bed at night. Gave me other things to ponder besides girls. The spinthariscope was invented by William Crookes in 1903. While observing the apparently uniform fluorescence on a zinc sulfide screen created by the radioactive emissions (mostly alpha radiation) of a sample of radium bromide, he spilled some of the sample, and, owing to its extreme rarity and cost, he was eager to find and recover it.Upon inspecting the zinc sulfide screen under a microscope, he noticed separate flashes of light created by individual alpha particle collisions with the screen. Crookes took his discovery a step further and invented a device specifically intended to view these scintillations. It consisted of a small screen coated with zinc sulfide affixed to the end of a tube, with a tiny amount of radium salt suspended a short distance from the screen and a lens on the other end of the tube for viewing the screen. 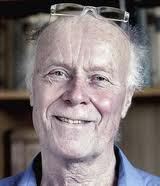 Crookes named his device from Greek σπινθήρ (spinth´ēr) "spark". 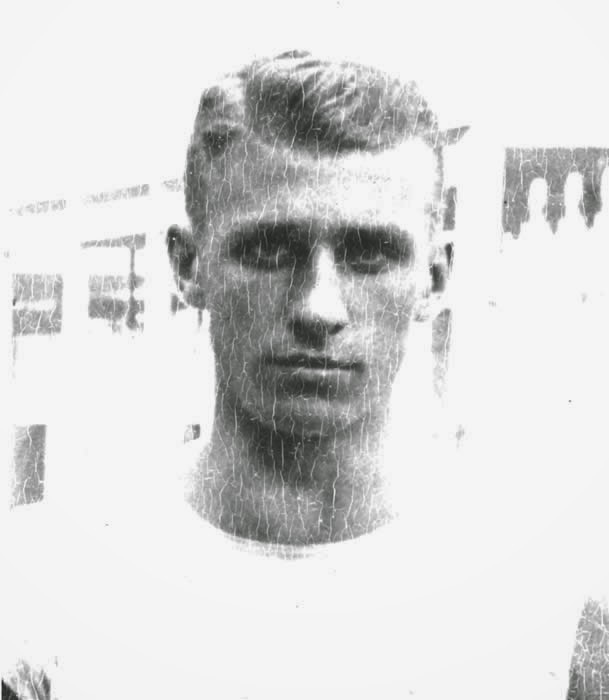 A century ago, a Yale medical student named Alfred Carlton Gilbert won a gold medal at the 1908 Summer Olympics in London. He would go on to become enormously successful -- as neither an athlete nor a doctor, but as an inventive manufacturer of educational toys. His New Haven business became renowned for Erector sets and American Flyer model trains. 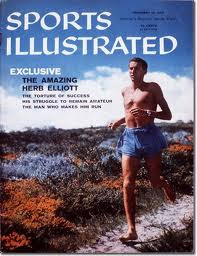 Of slight build at 5' 7" inches and 135 pounds, Gilbert developed himself into an outstanding athlete. For two summers during high school, he attended the School of Physical Education in Chautauqua, New York. 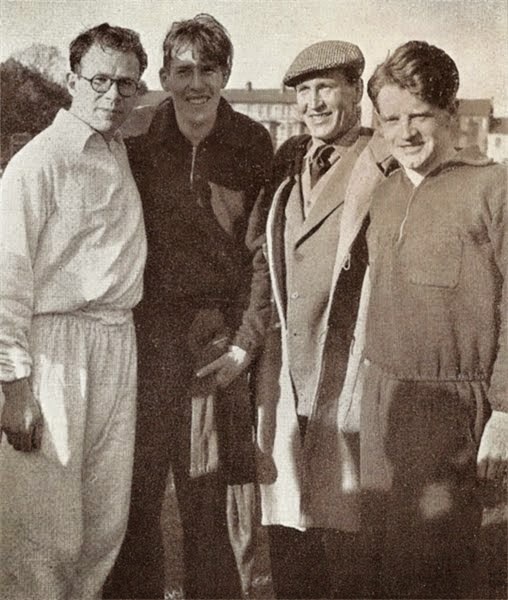 Its director, J. W. Seaver, also headed the Yale Gymnasium, and he recommended that Gilbert eventually get a Yale medical degree to prepare for a top job as a physical education director. 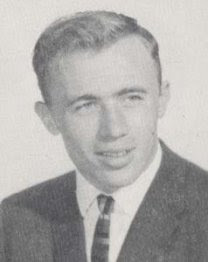 Gilbert first enrolled at Pacific University in Oregon; as a freshman, he was captain of the track team and quarterback of the football team. In 1904, after a single year of college, Gilbert, 20, entered medical school. 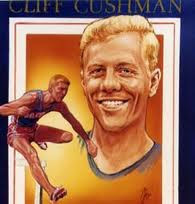 While at Yale Gilbert set two world records in the pole vault, once soaring 12' 8". 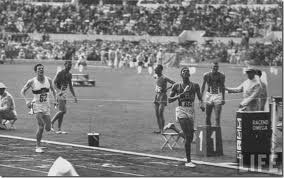 But at the London Olympics, which were marred by international discord and disagreements over judging, he ran into difficulties. 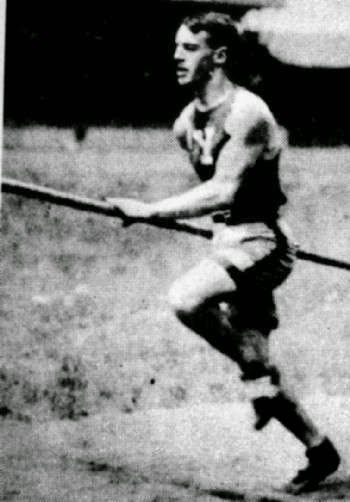 Most pole vaulters set their poles in a hole in the ground for stability; Gilbert had been one of the first to adopt this method. Vaulters in England, however, used a spike at the end of the pole, and the English judges ruled the use of a hole illegal. 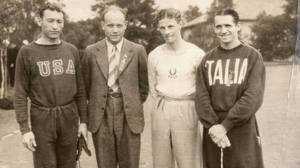 Gilbert nevertheless set an Olympic record at 12' 2". Yet the judges declared a tie because, in a heat, E. T. Cooke of Cornell had cleared the same height. 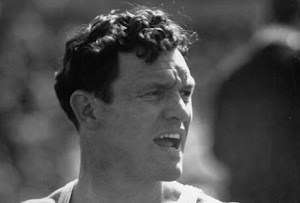 In his autobiography, The Man Who Lives in Paradise, Gilbert noted that this was "the first, last, and only time in Olympic history that a performance in a heat in the pole vault counted equally with performances in the finals." 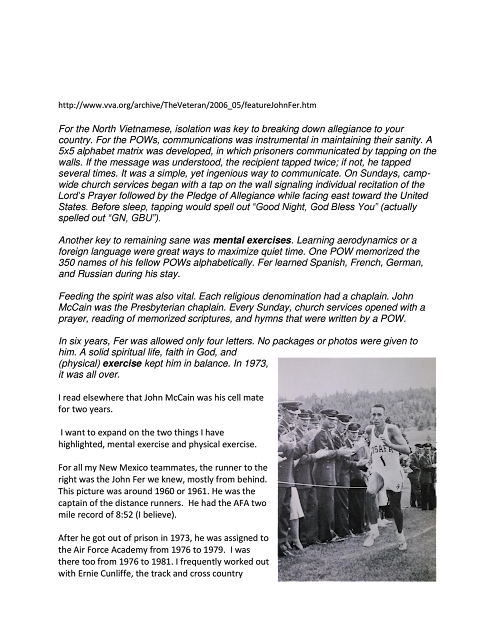 Cooke refused the gold medal; the Queen presented it to Gilbert. 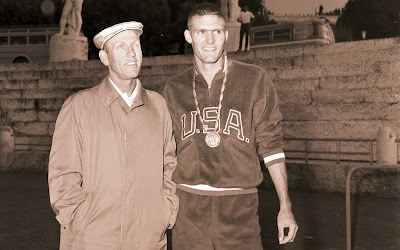 This may not be true as Cook is reported to have lost his gold medal in Dayton, Ohio during a burglary. and ended up in fourth place in that event. 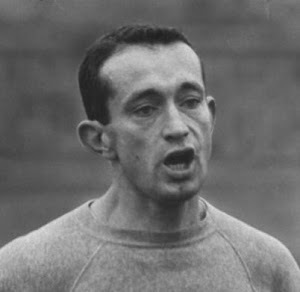 After the Olympics, Gilbert returned to Yale to finish medical school. As he was no longer eligible for Yale athletics, he put more time into magic. 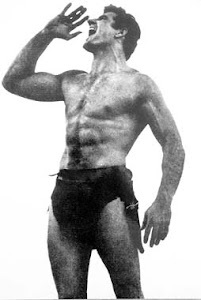 He was an accomplished performer and while at Yale had put on magic shows in clubs from Boston to New York. Now, he and a partner set up the Mysto Manufacturing Company, concentrating on magic trick boxes. Gilbert's Yale professors tried to persuade him to stick to medicine and use his deft magician's hands for surgery. But business boomed. In 1910, Gilbert opened a magic store in New York City. During his train commutes, Gilbert observed the electrification of the railroad through the erection of steel girders to carry the power lines. He thought "how fascinated boys might be in building things out of girders." 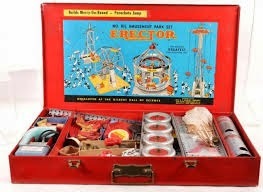 Thus began the Erector set. In 1911, he cut out the first girder patterns in cardboard. His girders fit together more securely than existing construction sets, and the motors he included for action made his toy unique. Gilbert introduced Erector in 1913 at the New York Toy Fair. He placed eye-catching ads in national magazines, headlined with his personal slogan: "Hello Boys! Make Lots of Toys!" In 30 years, he sold 30 million Erector sets. 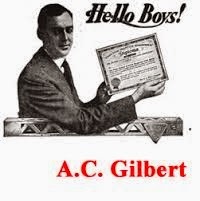 Gilbert started one of the first radio stations in the country, broadcasting the first infomercials (for his toys). He increased sales through Gilbert books, clubs, and contests and by opening the Gilbert Hall of Science in New York. 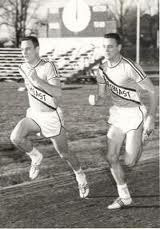 Throughout, Gilbert kept his passion for athletics. In 1928, he sponsored and hosted the first national sports radio program, on which he interviewed Babe Ruth and other greats. 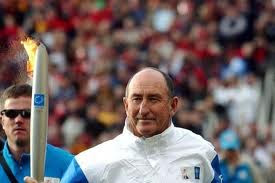 He served as advisory coach at Yale for 30 years, helping to develop what he called the "Yale dynasty in pole vaulting." 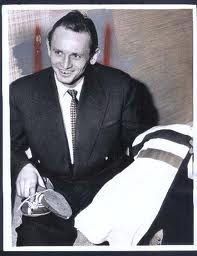 He also served on many Yale and national athletic committees, and he managed the 1932 and 1936 U.S. Olympic teams. 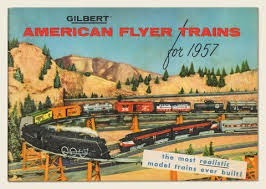 The A. C. Gilbert Company closed six years after Gilbert's death in 1961. Today the five-acre complex in New Haven, called Erector Square, provides studios for dozens of artists. The Eli Whitney Museum in Hamden, Connecticut, displays A. C. Gilbert products. 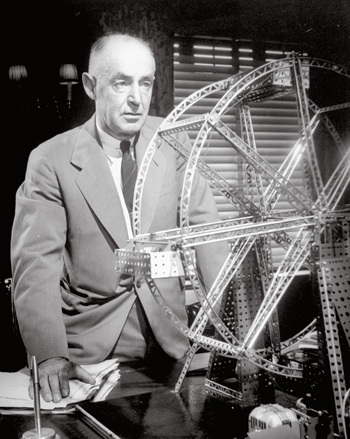 MIT's website calls Gilbert "one of the most multi-talented inventors of all time." The Smithsonian Institution's Palace of Progress on the Internet includes two Gilbert artifacts: a 1936 Chemistry Outfit for Boys and the prototype of a heart pump, which Yale surgery professor William Glenn and his student, William Sewell Jr. ’50MD, built in 1950 -- with an Erector set. 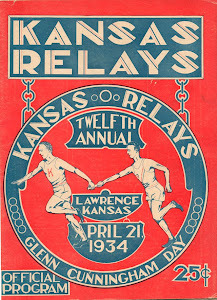 Sports Reference wrote the following account of the event. 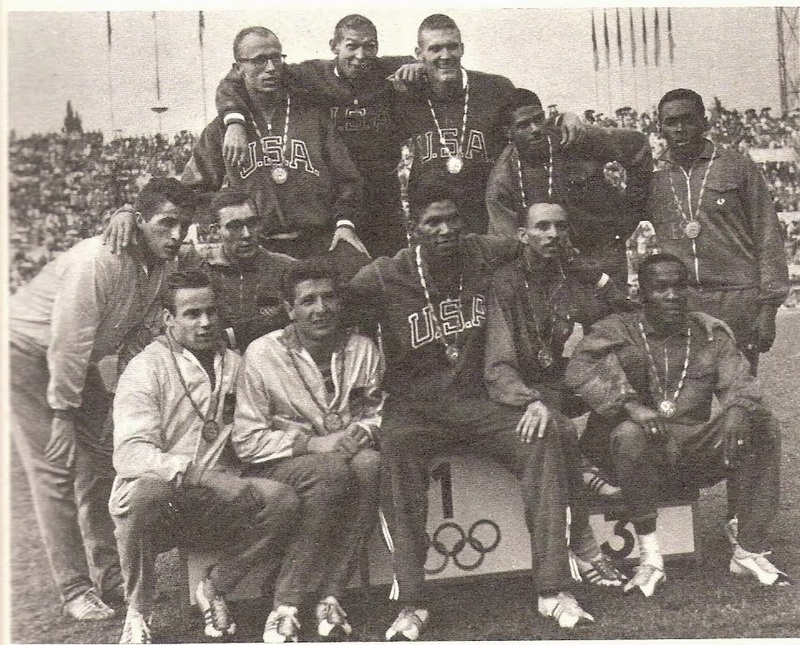 , two gold and three bronze medals were awarded. 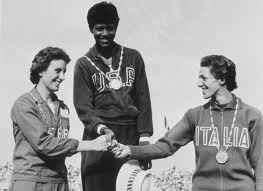 at the two previous Olympic Games. that states Cook refused to accept the medal.